For the record, my cookie monsterness is in full effect. 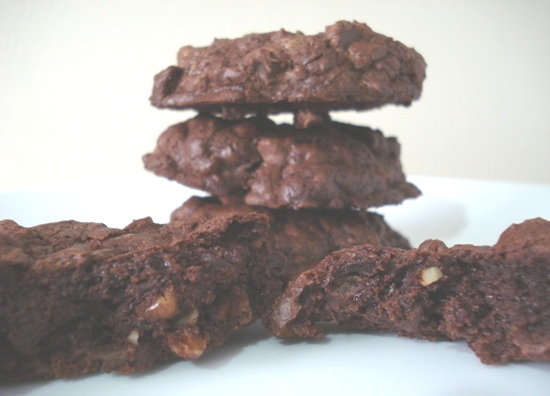 Since the beginning of the year, I’ve baked three kinds of cookies–chocolate chip oatmeal (aka Neiman Marcus), Mexican Wedding, and Chocolate Chip with Pecans, and it was high time I got around to baking chocoooolate ones. 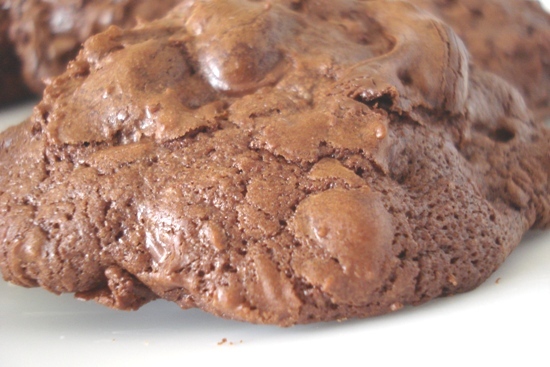 Well, Ghirardelli’s Ultimate Double Chocolate Cookies recipe is truly thee “ultimate”. 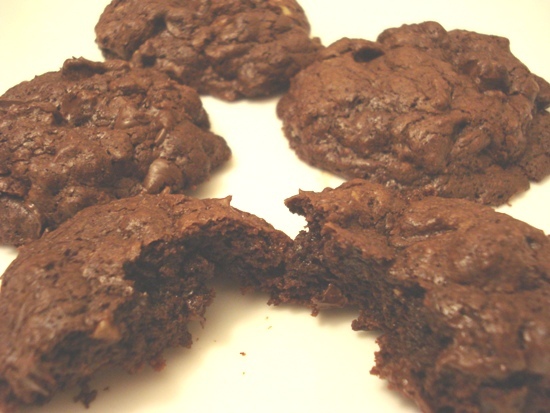 It only has a 1/3 cup flour, the rest is pure cocoa bliss (2 kinds of chocolate–both Ghirardelli of course–one is melted, the other mixed in). 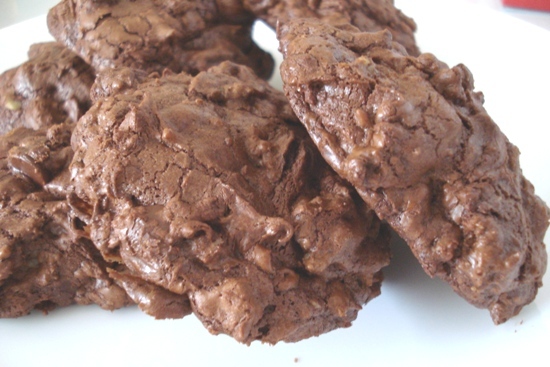 Biting into one of these is like a candy bar in cookie form–oooh yeah. Mmmm. And while I’m not nutty for cookies with nuts (hahaha) and was duly tempted to leave them out, in a moment of spontaneity, I threw in a 1/3 cup of pecans before I reverted back to my dull, conservative ways. The recipe calls for making two logs with the dough and refrigerating for at least an hour, then cutting into 3/4-inch slices. But me, ever the slacker, er, I mean efficiency-seeker, I snugly fit plastic wrap on top of dough (in the mixing bowl) and stuck bowl in the freezer for 20 minutes. While the first dozen baked, the mixing bowl (with remaining dough inside) went back in freezer. 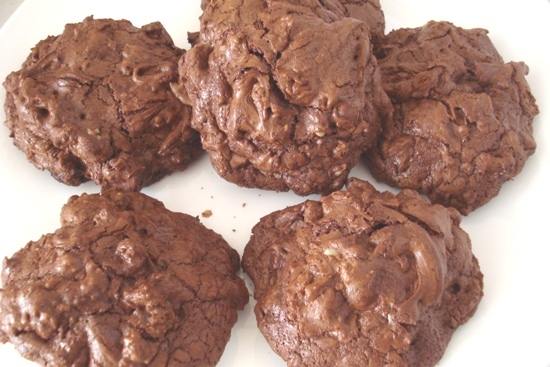 So it’s up to you–either follow the original recipe or take the easy way out like me (LOL) by making ’em drop cookies. In a large bowl, beat eggs and sugar until thick. Stir in chocolate mixture. In small bowl, stir together flour and baking powder; stir into chocolate mixture. Gently mix in semi-sweet chocolate chips and nuts. Using a sheet of plastic wrap, form dough into two logs, each 2 inches in diameter and about 12 inches long. As dough will be quite soft, use plastic wrap to hold dough in log shape. Wrap tightly; refrigerate at least 1 hour or until firm. (Dough may be frozen; thaw in refrigerator before proceeding with recipe.) Heat oven to 375°F. Unwrap dough; with sharp knife, cut into 3/4-inch slices. Place slices 1 1/2 inches apart on greased or parchment-lined cookie sheet. Bake 12 to 14 minutes in preheated oven (375° F) or until shiny crust forms on top but interior is still soft. Cool on baking sheet until they firm up a bit before transferring to wire racks to cool completely. Store in airtight container up to 1 week. I didn’t use the flash! One day, I’ll learn to snap photos while there’s still sunlight so no yellow or blue hues show up! If you think this looks good, just wait ’til you taste it!